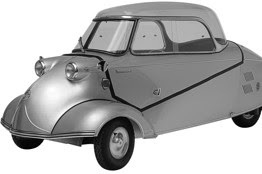 “The 300 objects on display range from terrific toys — such as the three-wheeled micro car above. Plus a shiny Vespa motor scooter, an even shinier Sputnik and some Apollo space suits showing signs of wear — to futuristic frocks by designers such as Paco Rabanne and Pierre Cardin. There are Eames chairs and Dieter Ram radios, and Raymond Loewy’s drawings for the interiors of spacecraft…. Robert Rauschenberg’s 1963 painting “Kite,” with its menacing military imagery, contrasts with the near-primitive Socialist-Realist pathos of a 1950 tapestry woven by Polish art students. If you can’t make it to London, visit the show’s excellent website here.